← Six Awesome Reading Experiences for 2018! Seven Things You Never Knew About “Frankenstein” (the novel)! 200 years ago, the first version of a novel called Frankenstein; or, The Modern Prometheus was published. It was written by Mary Godwin – later to be known as Mary Wollstonecraft Shelley – but published anonymously. Women had been authoring and publishing Gothic novels for several decades before the publication of Frankenstein, but this work was directly influenced by the personal and controversial philosophies of Mary’s parents and husband. She did not put her name on the book as author until 1823, when the second edition was published in France. 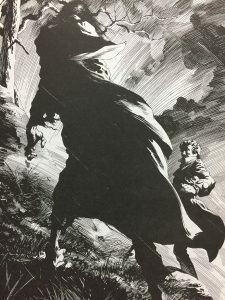 To celebrate the anniversary, Excalibur Books is mounting a special campaign during the first half of 2018, and here is part one – “Seven Things You Never Knew About Frankenstein (The Novel)”! We would like to thank Katherine D. Harris, Associate Professor in the Department of English and Comparative Literature, San José State University, for her creative input into this article. 1) The novel was conceived under very strange circumstances. In 1816, the group of bohemian artists and friends Mary Shelley (then Mary Godwin), Percy Shelley, Lord Byron, and John Polidori, were traveling in Europe and staying at the isolated mansion called Villa Diodati, near Lake Geneva. They decided to have a contest – to see who could come up with the scariest story. Mary had a nightmare which she used as the inspiration for Frankenstein. Dr. Polidori thought up a tale which he later turned into the novel The Vampyre, published in 1819; this was the first literary exploration of vampires, published 78 years before Bram Stoker’s Dracula. 2) The whole reason the group were inside the gloomy villa scaring each other instead of being outside enjoying the picnics and activities they had planned, was because 1816 was the ‘Year without a Summer’. In 1815 the massive eruption of Mount Tambora in the Dutch East Indies caused a mini-Ice Age, with many freak weather events being felt around the world. 3) The novel is written in a structure that now looks highly unusual – but at the same time eerily familiar – to many modern readers. It begins with the framing device of a sea captain named Robert Walton writing a letter to his sister (an epistolary frame, which is also how Bram Stoker would later write Dracula), relating the story told by Victor Frankenstein, a castaway who the ship picked up when he was lost in the Arctic. The narrative frame of many Gothic novels prior to Frankenstein was a ‘found text’ often articulated by a stranger – a kind of spiritual ancestor to modern ‘found-footage’ movies such as The Blair Witch Project, Cloverfield, and Apollo 18. Halfway through, the point of view switches to the monster telling the tale of his ordeals to Dr. Frankenstein, who is repeating this to the captain. The technical literary term for this is ‘hypodiegetic narrative’, which makes the creature’s monologue within Frankenstein’s monologue within Walton’s monologue a ‘hypohypodiegetic narrative’. There’s one to impress your literature teacher! 4) Electricity was not used in the novel to bring the monster to life. In the novel, Victor deliberately kept the process secret, because he did not want others following his research. 5) In his book The Billion Year Spree, author Brian W. Aldiss declared that Frankenstein could be considered as a pioneering work of science fiction and a precursor to the genre, noting “how precariously it is balanced between the old age and the new.” The distinctively original element, in his opinion, was fantastic plot elements being presented as the results of human technology, and not through supernatural causes. 6) Amongst her many other works, Mary Shelley wrote another science fiction novel – The Last Man, published in 1826, the tale of a future world ravaged by plague. This means that she could be considered as one of the earliest writers working in what we now know as ‘Post-Apocalyptic’ fiction, because ‘yellowbacks’ and ‘sensation novels’ (cheaply produced novels designed as mass entertainment, the precursors of 20th century pulp fiction) often dealt with fantastical and apocalyptic changes being brought about due to the Industrial Revolution. 7) When Mary Shelley started writing the book, which formed the basis of an entire cultural phenomenon that has been going strong for two hundred years and shows no sign of losing popularity – and created one of the most recognizable global horror icons – she was only eighteen years old. As part of the Frankenstein 200 campaign, Excalibur is selling “Moonlight, Murder & Machinery” at the discounted price of $1:99 until the end of March 2018. In this alternative history Gothic romance, Mary Godwin, Percy Shelley, and Lord Byron go on the hunt for Frankenstein’s monster through a bizarre Steampunk Regency England – crossing swords with such grotesqueries as Boiler Calhoun, Doctor Ravenhill and the deadly Dandy Brethren! Sign up to the newsletter subscriber’s list here for more news and bargains! 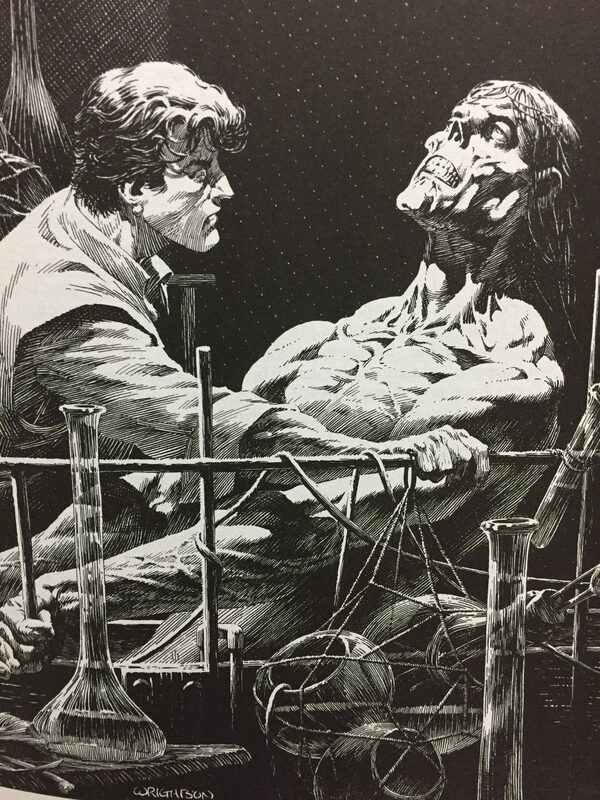 Illustrations by Berni Wrightson, taken from the Marvel Illustrated Novel version of “Frankenstein”, All Rights Reserved. This entry was posted in Alternative History, Horror, Literature. Bookmark the permalink. 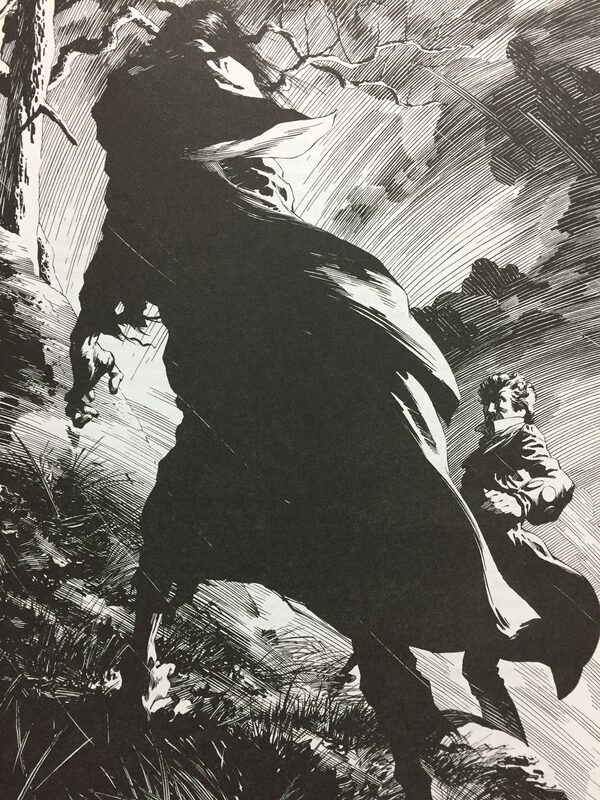 27 Responses to Seven Things You Never Knew About “Frankenstein” (the novel)! 1) Mary Shelley published this work anonymously because it was controversial and embedded philosophies of her father and mother (and husband) into it. Women had been authoring and publishing Gothic novels for quite a few decades prior to the publication of Frankenstein. 2) Robert Walter was writing to his *sister* not his niece. 3) The structure of the novel is not highly unusual for the 18th & 19th century. *Frankenstein* not an epistolary novel. The novel begins with the frame of letter writing and turns into journal writing. The narrative frame of most Gothic novels prior to *Frankenstein* was as a “found” text often articulated by a stranger. 4) Science Fiction as a genre developed much later. *Frankenstein* is a precursor to Sci-Fi and modern horror fiction. But, it’s not the first sci-fi novel. 5) That’s a stretch to say she wrote the first post-apocalyptic novel. There was an over-abundance of short stories, fiction, and novels floating around in the 18th and 19th century, many of them not studied in college courses. In fact, Railway Novels or Yellowbacks often dealt with the fantastical and apocalyptical in the face of the Industrial Revolution. #2 should be Walton (not Walter) but editing featured isn’t on for this post. Katherine, thank you for your comments! We apologize for the inaccuracies and will amend this article as soon as possible. Katherine, the inaccuracies have been corrected. Thank you for your input!